Sojag is well known as a supplier of high-quality hardtop gazebos and outdoor sun shelters. They’ve been at it for many years, and this Canadian company continues to innovate, providing excellent materials, simple designs, and all the features you need to create the ultimate outdoor room! 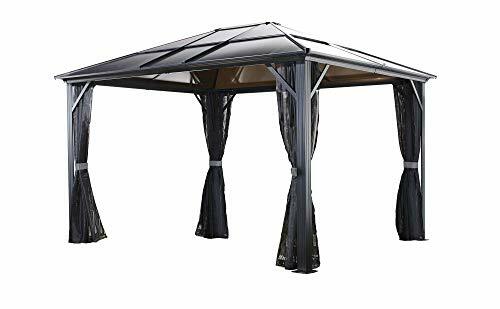 In this article, we will take a broad look at Sojag’s product line,and do several Sojag Gazebo Reviews. 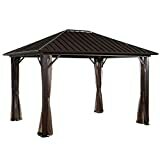 We’ll focus on the most popular options of Sojag gazebos. Identifying the differences between models can be confusing, and we hope to provide some clarity on their product line, and what distinguishes their various lines of Gazebos from one another. We’ll start with some general information on Sojag’s gazebo line, and then move into individual reviews. In this section, we’ll look at the major aspects buyers should keep in mind when digging through Sojag’s catalog. These items will help identify the differences between the various gazebos on our list. The footprint of the Sojag Gazebo is the area from the outside of the posts. Keep in mind that the actual usual space will be a little bit smaller than the advertised size (e.g. a 10′ x 10′ gazebo may end up being 9′ x 9′ inside, between the posts). If you have a specific piece of furniture, hot tub, or another item you plan on placing under the gazebo, be sure to check its dimension relative to the Gazebo you’re considering. Where possible in these reviews we include dimensional charts for clarification. 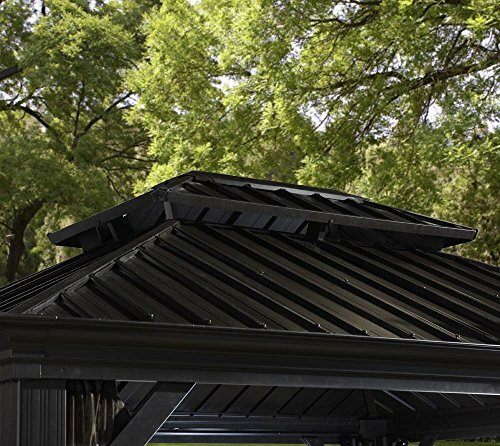 There are two major roofing materials for hardtop gazebos, including virtually all of Sojag’s gazebo line. These two materials are steel and polycarbonate. A steel roof is the most expensive option, and in most cases is the best option. 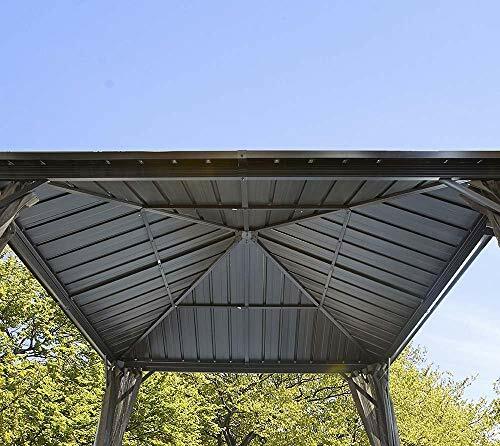 A steel roof provides 100% shelter from the sun, giving those sitting underneath the gazebo welcome shade. Of course, the open walls allow the breeze to flow, so it’s easy to stay cool inside a steel-roofed gazebo. Steel is an extremely robust material and is largely maintenance free. Of course, you’ll want to clean it off in winter when the snow is on it, but otherwise, you won’t need to do much of anything to it. Polycarbonate panels are essentially tinted plastic panels. These panels are not completely opaque, and let some light through the roof. Some may like this effect, but the end result is that the sun shelter isn’t a complete sun shelter, just a partial one. It’s like you put sunglasses on your roof. That’s nice, but not the complete shelter of a steel roof. Polycarbonate panels are often used in backyard greenhouses, and those are pretty much designed to get hot! This should speak volumes as to how polycarbonate roofs might work. If you’re going to choose a polycarbonate roof system, you may want to place some silicone caulking at the point where the panels meet the roof. It is not uncommon for water to enter in between the layers of the panels. This should not cause leaks, but it will be unsightly for a while. Some Sojag sun shelters include a two-tier roof, while others offer only one tier. The two-tier roof is a nice extra, as it provides ventilation out of the top of the gazebo, ensuring that everything underneath the gazebo remains cool. In those cases where there is a two-tier roof, the space between the two tiers is protected with mosquito netting to prevent critters from getting in, and the roofline is pitched such that water almost never gets between the tiers. Does it Get Hot Under a Steel Roof? 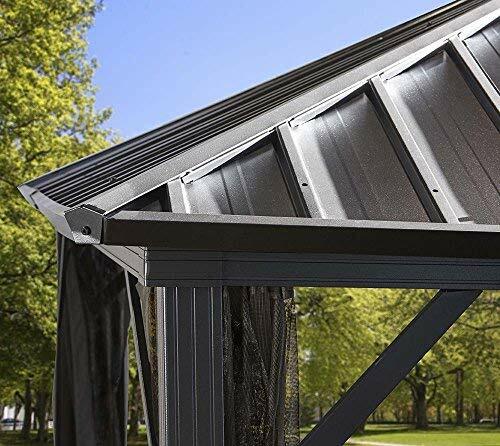 It usually does not get particularly hot under a steel roof, though polycarbonate can be a bit different. A two-tier roof is cooler than a single-tier roof, but generally, it’s not hot under either. 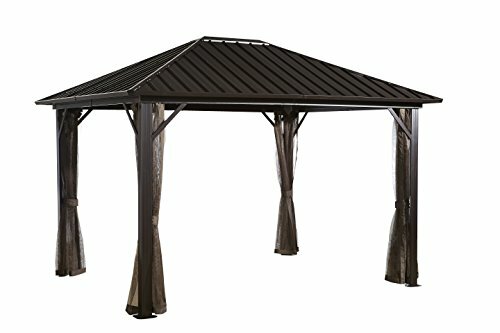 Does a Sojag Gazebo Roof need to be removed in winter? Fortunately, no, you don’t need to remove the roof in the winter. You do, however, need to regularly clean snow off the roof, in order to ensure that it is not subject to too much weight. If you’re in an area where snow tends to accumulate, you want to keep on top of your roof (sorry, pun intended!) when the snow flies. It’s best to use a roof rake to get the snow off of the roof before too much accumulates, as excess snow weight can cause the gazebo to collapse. Most of the frames for Sojag Gazebos are either aluminum or steel. The legs and beams are usually made of one of these two light-weight metals, and these are both a good choice for frame materials. Aluminum does not rust, and it is quite lightweight, which are two major advantages to this material. Also, aluminum is generally a little bit easier to assemble than steel, as it is a little bit lighter to work with. Steel is generally a little bit stronger, and a little bit heftier than aluminum. If the powder coat gets scratched or otherwise damaged, steel can rust over time. If continuously exposed to inclement weather, you may find rust where the welds are, and on any scratches. It’s a good idea to periodically check your powder coat, and repaint when necessary. 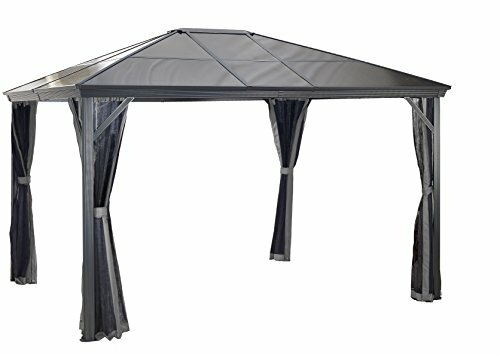 Some gazebos contain internal gutters that route water raining down on the roof to interior channels, and then dispense them away from the gazebo floor. Other gazebos offer add-on gutters, which are better than nothing. And finally, some Sojag gazebos don’t allow for gutters to be installed, so water will just drip off your roof in an uncontrolled manner. Depending on how you plan to use your gazebo, the gutter design will be more or less important to you. Sojag offers some gazebos with included side panels and mosquito curtains, while for most these are extras. They can be quite helpful and can make it much more comfortable to spend time in your gazebo at night. 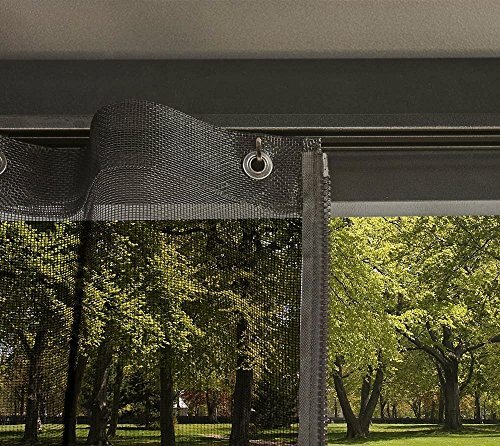 Some of the gazebos don’t have any factory-installed curtain rods, and if this is the case, you may need to jury-rig your own curtain solution. Not impossible, but certainly inconvenient! 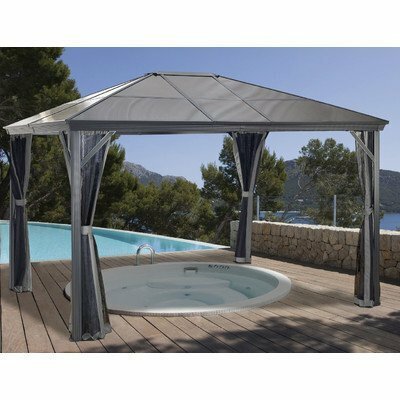 Virtually all of Sojag’s gazebos include a two-track curtain system, and most include mosquito netting as part of the package. Usually, privacy panels are not included but are available as an extra. The way the gazebo attaches to the ground is critical to maintaining the gazebo in inclement weather. All of the Sojag gazebos we’re looking at today have spaces on the legs to bolt them to the ground. Depending on what your ground is, you’ll have better or worse success securing your gazebo. If you’re attaching your gazebo to a standard lawn, could temporarily opt to use ground stakes (think beefed-up tent stakes). These do not supply a whole lot of holding power, and the connection to the lawn is poor. Unless you’re going to just be keeping the gazebo in that location for a few days, and you know it won’t be particularly windy, we would suggest not doing this at all, as you risk damaging the gazebo, and your guests! Now we’re talking! It’s a little bit of work to attach a gazebo to a concrete patio, but it’s not terrible. You’ll need a ramset gun (drill) in order to drill into the concrete, but once you’ve got your holes done, you’re on easy street. You can often rent these guns from your local home improvement store if you don’t have one yourself. They’re not very hard to use, and you’ll be done in an hour or so. Once you’ve got your lag bolts into the concrete, your gazebo won’t go anywhere. Like a concrete patio, a deck is pretty simple to secure a gazebo to. You can drill into your deck boards and install lag bolts down through the decking. This method is pretty simple and provides a very sturdy connection from the gazebo to the mounting surface. This can be a challenge for gazebo connections, depending on the brick pavers you have. If the pavers are quite large, you may be able to mount the gazebo to the pavers, but if they’re smaller blocks or bricks, then you won’t be able to drill into the concrete, and they won’t provide much holding power anyway. In these cases, a better way is to go down underneath the patio, install a concrete footing (see below). If you don’t have a good connection between the ground and the gazebo, it’s best to install concrete footings. Typically these are made up of cardboard tubes, buried in the ground 3-4 feet. 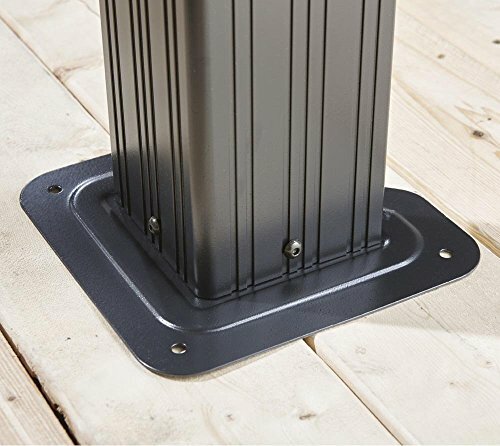 They are filled with concrete and can provide a very sturdy mounting solution for a gazebo. This is a similar design to the way decks and porches are often mounted to the ground. If you’re in an area where the ground freezes, you may want to check with your local building department regarding the recommended depth of the concrete footings. Most of the time, you won’t need a building permit or HOA approval to install a gazebo, but you may want to check with your local department or HOA before you install. There may be requirements for distance from a lot line and the like that you might run into. Sojag Gazebos are not terribly difficult to put together. And Sojag is pretty thoughtful about their instructions. There are easily-accessible Youtube videos showing how to assemble their gazebos, step by step, made by the company. Watch the video before you start, and the assembly process will be pretty simple. We’ll link to these videos throughout our the reviews. Sojag didn’t make one for each gazebo, but the process can be generalized to some degree. If you’re in an area where the winter is powerful, it’s not a bad idea to get a winter cover for your gazebo. These provide a good deal more protection to the gazebo against snow, hail, and ice, and will increase the longevity of the gazebo. Of course, you’ll still need to clean the snow off your gazebo regardless, but a winter cover is certainly a plus! Many wonder if you can use a firepit under a hardtop gazebo. Generally, the answer is yes when it comes to the steel roof options in Sojag’s line of gazebos. It’s probably best to stick to propane fire pits or ethanol fireplaces, where there isn’t a whole lot of smoke billowing up. And you may not want to use the privacy panels when the fire pit is on, as that may concentrate the gasses too much. If you’re interested in one of the polycarbonate roof models, you should not use a firepit under it. The heat from the fire pit could warp or otherwise damage the panels, ruining the integrity of the roof. Sojag offers a 1-year warranty on all of their gazebos, though you should check to confirm that your individual choice is covered under the typical Sojag warranty. Also, Sojag is pretty good in terms of replacement parts and typically has most parts on hand, depending on your needs. In this section, we’ll look at several of Sojag’s most popular hard top gazebos and sun shelters. We’ll identify the differences between them, and the reasons they are priced as they are. Includes mosquito screen, but not privacy curtains. The Sojag Dakota is an attractive, mid-range gazebo from Sojag. It features a steel roof and aluminum frame with a single tier. This design translates into a super sturdy, robust hard-top gazebo. The posts are pre-drilled for bolts to be installed into your mounting layer. Included in the package is a two-track curtain system and mosquito netting. The mosquito netting is generally good enough to ensure that most mosquitoes do not get inside the sun shelter, but occasionally one gets in. If you want to supplement the inside of the gazebo with some mosquito proofing, it may not be a terrible idea. But generally, the screens do a decent job. The Dakota doesn’t have a gutter and downspout system for channeling water away from the gazebo, but it does include a horizontal railing system. This railing system essentially channels water to specific places where it drips off the roof. These locations are somewhat out of the way from people entering and exiting the gazebo. While this system isn’t as good as a real gutter and downspout design, it’s better than nothing! Overall, the Dakota line is a solid mid-range, mid-sized gazebo option from Sojag. The steel roof is always a plus, and the presence of the two-track system means you won’t be driven nuts trying to install screens and privacy panels on this one. If you want a good gazebo with some solid features without hitting the top of the line, the Dakota is an excellent choice. Click here to check the price on Wayfair before you buy! The Messina line by Sojag is an outstanding choice. In fact, the Sojag Messina is the best hardtop gazebo available, in our estimation. It includes a steel roof in a two-tier design, ensuring that those sitting underneath will remain cool and comfortable, with good ventilation. There is a hook present on this gazebo, should you want to add a light or outdoor ceiling fan. A two-track railing system is included with the Messina, as well as mosquito screen panels. They do a pretty good job of keeping the mosquitoes out, though a bugger will get through from time to time. There is an additional track for privacy panels, should you desire to add these on. Gutters and downspouts are a nice addition to this gazebo, which really takes it over the top in terms of quality. Water is channeled from the roof to each of the posts, and are dropped down the posts and expelled out the bottom of the posts. Of course, if you’re on a concrete pad, you’ll have to think ahead and consider where the water will go when it gets to the bottom of the posts, but generally, this is not a big challenge. In terms of assembly, you’ll need to devote at least 6 hours, and have two people on hand, to assemble this gazebo. Sojag has a great video showing all the steps required to assemble the Sojag Messina hardtop gazebo. The Sojag Messina is a beautiful, highly functional, high-quality hardtop gazebo sun shelter. This one ticks virtually all the boxes and is available in multiple sizes to accommodate many different needs. The Sojag Genova is another solid, large-format gazebo from Sojag. It comes in a dark brown color, which is quite attractive and has a single-tier steel roof. In many ways, it is similar to the Dakota gazebo, but it does not have the gutter channel system on it. Essentially this gazebo is a slightly larger format version of the Dakota, at a slightly higher price point. It includes the usual two-rod curtain system, and the mosquito panels to keep the bugs out. As usual, privacy panels aren’t included but are available. The single-tier steel roof and curtain assembly is all pretty similar to the Dakota, while the gutter system is a bit of a letdown. However, the larger footprint is a nice step up, making this a great choice for those who want a steel roof and large footprint but are less concerned about bells and whistles. Be sure to check the price on Wayfair as well! The Sojag Verona a polycarbonate roof gazebo kit, with a single-tier roof system. The panels are well made with the same aluminum frame found on Sojag’s higher-end gazebos. It’s attractive enough, and the polycarbonate gazebo’s cost is certainly more enticing than many of the steel roof gazebos on our list! Still, the polycarbonate design is definitely a step down, as the plastic roof just doesn’t have the style or elegance of a steel roof. Additionally, unlike the steel-roof gazebos, the polycarbonate roof cannot accommodate a fire pit table. The heat emanating from the fire pit could conceivably warp the polycarbonate panels over time, and ruin the gazebo roof. The panels are tinted in a smoke color, though they do allow some filtered light through. 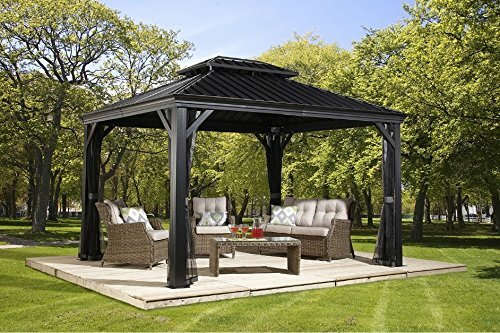 If you’re going under the gazebo to escape the sun, this gazebo will provide significant protection, but not total protection as a steel-roof gazebo would. The Verona is an attractive gazebo at a great price point. It’s fairly light-weight and robust and contains most of the features of the higher-end single-tier gazebos Sojag produces. The polycarbonate roof is a step down from the steel roofs of the other Sojag gazebos mentioned above but is decent. If you don’t care about some light getting through the panels, and you don’t plan to use a fire pit or grill under the Verona, it’s an excellent choice. Be sure to check out the price on Wayfair before you purchase! The Meridien is a little bit of a step up from the Verona, in terms of the footprint options available (these are generally larger-format) and the horizontal channel gutter system. With this design, water is channeled to points away from the entry area where it spills off the roof. This design isn’t as good as a gutter and downspout system but is better than nothing. The usual two-track curtain system is included with this design, as are the mosquito screening panels. Privacy panels are not included. For those looking for a larger format gazebo at a reasonable price, the Meridien line is a winner. It’s a slightly better model than the Verona line and keeps its price aggressive while delivering a quality hard-top gazebo experience. Be sure to check the price on Wayfair to compare! The Sojag line of hardtop gazebos is quite extensive, with many other variations including some like the Sojag Portland that is designed to sit directly next to the house. 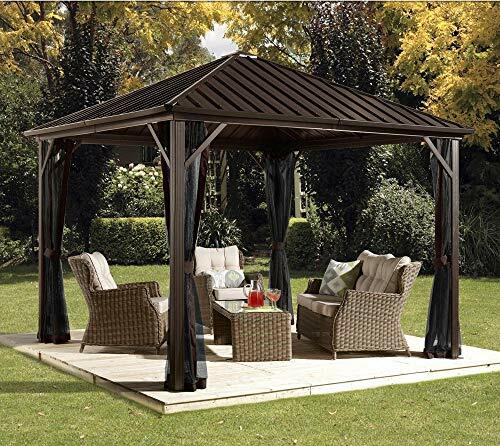 In this article, we’ve tried to focus on the most popular of Sojag’s gazebos, in order to highlight the major features of each and the differences between them. In general, the major factors that come into play are the type of roof and footprint. The larger the footprint, the more expensive the gazebo, and a steel roof is almost always more than a polycarbonate roof. Beyond that, there are small tweaks like the gutter and downspout design, curtain design, and the like. Sojag makes excellent quality gazebos, and have had a sterling reputation since 1993. We hope you are on track to finding your next outdoor living space!